There are many ways we are imprisoned physically, but it’s in the physical we are chained spiritually and vice versa. The two, although separate, work cohesively together. Where one person is captive physically, it affects them spiritually and where one is captive spiritually it affects them physically. In the physical, we are held captive in religion, knowledge, success, money, beauty, lust, and pride to name a few. When imprisoned in these ways it affects us spiritually by moving us further into sin. Refusing to admit there is a problem, we begin worshipping/idolizing them over the one true God. When this happens, we remove ourselves from church, from groups/accountability, we stop praying and become angry at God for hiding this new-found “fruit”. But we forget, our thoughts are not His thoughts and our ways not His ways (Isa. 55:8). Becoming wise in our own eyes (Isa. 5:21), our spiritual eyes begin to dim, our hearts harden and our spirits begin turning away from God crippling our spirits and lacking the ability to connect to the Lord. Nobody likes to talk about things we can’t see but this too is a way we are bound spiritually. Where we are imprisoned spiritually has a direct outcome in the physical. Is there a place called Hell? Yes! Is Satan real? Definitely! He is the Accuser and cause of all evil! He will do anything he can making sure you stay captive in his ways. Whether we want to believe it or not, there is a battle waging over us (Eph. 6:12) and a lot of our circumstances and problems in the physical are a direct outcome of the battle going on in the spiritual. How, in all of this, can I say, “I can’t be bound?” It’s easy to focus on the negative and believe yourself unworthy, trust me when I say that; I sang the song and played the fiddle all to well. I was once the queen bee of negativity. In all honesty, I had a major misunderstanding of life and what it truly meant. Even though I believed in God and He sent His Son to die for my sins, I did not understand what that meant. I believed l was here to live life for me, I was a good enough to go to Heaven (Romans 3:23), but did not change my life. I continued living as slave to all my sins and believed life was live and let live and then you die and go to Heaven. In the book of John 8:1-11 we read about a woman caught in the act of adultery. The teachers of religious law and the Pharisees placed her before the crowd and asked Jesus, “What do you say?” Adultery was a crime and it was customary to be stoned to death for breaking the law. The religious leaders wanted to trap Jesus into saying something they could use against him so they continued demanding an answer from him. Men stood around Jesus with stones ready to fulfill the old laws punishment against her when Jesus says, “All right, but let the one who has never sinned cast the first stone.” One by one they each slipped away, until only Jesus was left in the middle of the crowd with the woman. He then says the most amazing thing, “Where are your accusers? Did not even one of them condemn you?” To which her reply was “No.” Jesus then told her, “Neither do I. Go and sin no more.” Jesus does not condemn, Satan does and then we in turn condemn ourselves as well as others. I can still be ensnared and lose my footing to sin but I can’t be bound by it any more. I am a work in progress, and through conviction of the Holy Spirit the old way of living continues transformation while other ways are renewed(Psalm 139:23-24). All things made new and possible for the eternal through Christ and it’s in Him I am no longer bound in the ways of the world. I am a masterpiece created in the image of God (Eph. 2:10), shaping me, molding me, growing me, and preparing me for life communing with my Heavenly Father. He is always there, waiting for us to reach up, face our sin and repent. While this transformation process takes place, He is always, always ready to cleanse and forgive. You are never too far gone that Jesus can’t save you, restore you, forgive you, and give you a second chance! 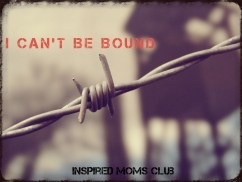 In Christ, you can’t be bound!